Always use a guard over the router bit when using a table mounted router. Some operations require a specific guard and today�s tip cover such a case. 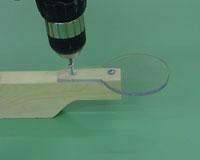 The material we are trimming is 1 1/6� thick and clamped to our shop made jig which has a 1/4� thick base. We will be using a 3/4� guide and a 1/2� flush trim bit. The total height of the bit, with the bearing and threaded screw is approximately 1 3/4� above the base plate. Our cover guard is 3/16" lexan mounted on 2" pine. We used 1" x 2” x 12” material cut to shape on the bandsaw as shown. 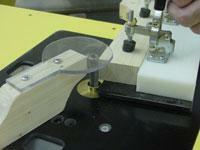 The lexan material is also cut on the bandsaw and attached with two screws. 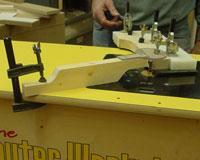 After setting the bit height, clamp the guard to the router table. The guard covers the bit and clears the hold down clamps.